It’s a regular favourite for first nights aboard Amelie Rose as it can be prepared on the way into harbour and then left to bubble away to itself while the Galley Slave is on deck getting parked up and squared away. Originally the recipe called for the whole thing to be baked in the oven – but we’ve found that it works perfectly well on the hob where it’s a damned sight easier to keep an eye on and speed it up or slow it down depending on how ravenous the crew are. We normally serve it with buttered baby spuds and green beans which works very well but have served it on a bed of rice or mash potato whilst underway and if you can’t find chicken then go ahead and substitute with turkey or even (if you need a veggie version) fried halloumi. This version will make enough for 6-8 (depending on appetites) but it’s easy enough to step up (or down) the amounts. Try it out and let me know what you think via the comments – especially if you come up with any improvements! 1.5 kg Chicken/Turkey diced into 1-1.5” pieces. (I tend use chicken thighs as they’re cheaper and then just hack up each thigh into 3-4 pieces with a pair of scissors). I’m sure that there was probably Salt and Pepper on the original recipe but I never bother adding them during cooking. They’re on the table when we serve and that way folks can control their own intake. If you normally season things then go ahead and do so at whatever point seems appropriate. Heat up the olive oil in a pan big enough to take all of the ingredients (preferably with a good heat-distributing base). Use a medium to high heat depending on the size of the burner and amount of chicken. Hack up the chicken and throw it in the pan. If you fancy yourself to be Jamie Oliver then do this in small batches – browning each before taking them back out of the pan etc. etc. blah blah blah. If you’re 20 minutes from harbour and just need to get the job done then chuck it all in and stir until coloured. Whilst the onions are softening to translucent, peel and finely dice the garlic. If you have a garlic press go ahead and use it – we don’t, preferring to use sharp knives or scissors for any job in the galley that requires turning a few large things into a pile of more, smaller things. When your garlic is suitably chastened add it to the pan and stir in. Clean any muck off the mushrooms, quarter and add to the pan. Add the chilli flakes and basil and stir in. Allow all this to fry for a bit until the mushrooms shrink and give up their moisture. Now add the tinned cherry tomatoes. If you want the end dish to contain tomato-sized explosions of mouth scorchingly hot liquid then leave them whole. If you like your dinner guests then I recommend bursting them all with the spoon or whatever stirring stick you’re using to agitate the contents of the pan (the tomatos that is, not your guests). Now go and change your top for one that isn’t covered in explosion tracks of tomato juice. Let all of this bubble for 5 mins or so (the contents of the pan that is – not your top – sheesh, this giving instructions thing is hard!). Next up add the soft cheese. Again, if you’re feeling all Hugh Furry-Whatshisname then you can do this a little at a time but I just drop it all in and then stir vigorously until the lumps have mainly disappeared. Don’t worry if it looks a bit curdled at this point – it’ll sort itself out. Bring the whole thing to a gentle boil then turn to a simmer. Leave it simmering for an hour to an hour and a half, stirring every 10 mins or so. If you want to eat sooner, turn up the heat but stir more often so that it doesn’t catch and burn. 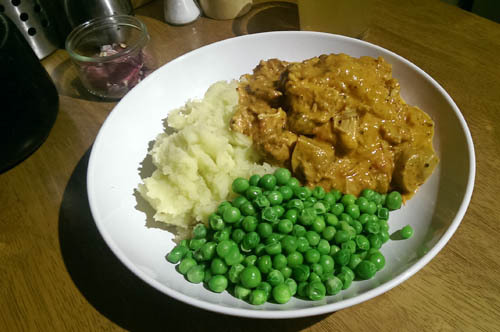 Once the sauce has thickened (about to the consistency of your average Chicken Tikka Masala) serve with buttered baby spuds and something green and crunchy like green beans or broccoli. Mash or rice work fine too, and peas would be ok as an accompaniment if you have a freezer to keep them in. That’s it! Let me know what you think, send me pictures of your results and if you’ve got an improvement or favourite recipe of your own then let me know in the comments. Bon appetite.